Lucky 88 is one of a couple of slot machines with a Chinese inspiration that Aristocrat has offered so far, but it has its own niche, so it’s not just a generally themed slot. 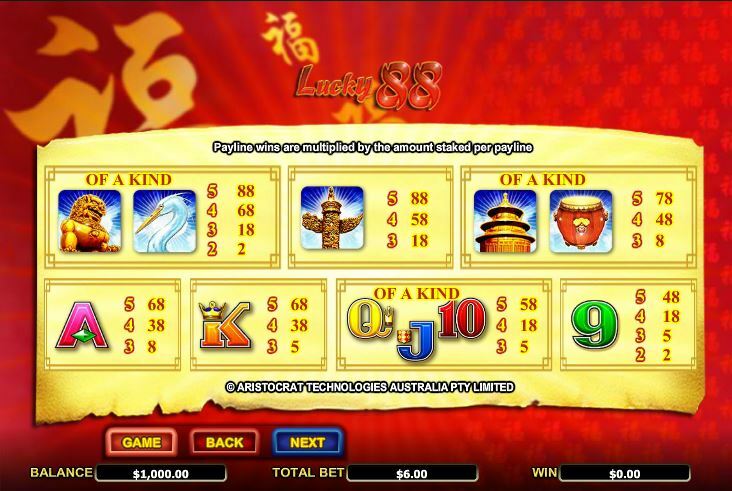 It focuses on the number 8, which is considered lucky by the Chinese, but it also takes a number of elements which are visible in a lot of other slot machines, like the paper lanterns or the firecrackers. 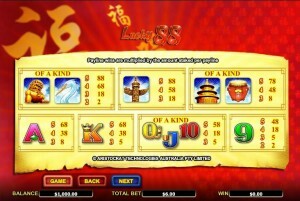 A 5 reel slot machine, Lucky 88 gets a total of 25 bet lines for you to bet on. 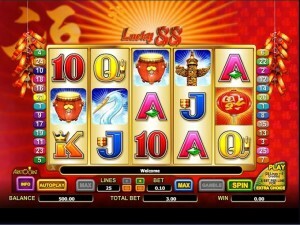 There are free spins with huge multipliers inside, plus scatter symbols and wilds (with up to 88x multipliers). The game will give away payouts of up to $3,552. The game has some very impressive features to give you, including a wild which can apply multipliers of up to 88x, scatter symbols, free games and extra choices which require additional wagers to be placed in order to trigger them. The Emperor symbol is a wild which is capable of offering its own payouts, but it’s also your typical substitute that can help you form combinations whenever it lands in the exact right spot for it. There’s more to the wild than just its substitution ability though, as it can apply multipliers chosen at random, the choices being 88x, 38x, 18x, 8x, 5x, 3x or 2x. The scatter is the only symbol which can’t be replaced with a wild. As for the wild’s own prizes, they go up to 888x for five symbols together on a line. The scatter symbol is also important, and it will pay up to 188 times the triggering bet when you have enough of them present on the reels. On top of that, it triggers the free spins of this slot. The Paper Lantern scatter will start up the slot’s free spins, whenever at least three of these symbols are present somewhere on the reels. An Extra Choice is available here, one for which you have to wager extra in order to get it. You can pick what free spins you want to get or you can roll the dice for some prizes. The options give you a number of free spins and a certain multiplier for the situations when wilds take part in winning combinations. The option with the largest number of free spins has 25 of them to offer you, plus the multiplier of the wilds will be 18x or 5x. The one with the smallest number has 4 free spins for you, but the multiplier of the wild reaches 88x. Besides having it triggered through scatter symbols, the free spins can also start up at random, at the end of a spin. If you choose the Lucky Dice option instead of the free spins, you will get a feature with 3 dice games. You need to roll as many 8s as possible, because how many there are will decide how big your prizes will be. The game normally allows you to use only one coin for each active payline, so up to 25 total. There is an option to activate an extra wager as well, which takes the total to 30 coins. Each coin has a minimum denomination of $0.01, with a maximum of $4. The wagers reach a maximum value of $120. 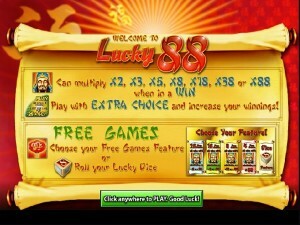 You can expect a top payout of 888 coins in Lucky 88, the game remaining faithful to the lucky number 8. The actual cash value goes as high as $3,552. Let’s not forget the scatter symbol here, which multiplies the total bet by 188, so you can expect up to $22,560 with its help. A variety of Chinese inspired images are used as the game’s main symbols, but most of them are not the kind that you see in other slot machines with a similar theme. They’ve used things like birds or drums, but plenty of others are playing cards which are in all the other titles as well. Overall, it’s a decent Chinese themed design, but nothing that would make you choose it over any of the others. Symbols: Emperor (888x, wild), Paper Lantern (188x the bet, scatter), Golden Dragon (88x), Bird (88x), Tower (88x), Building (78x), Drum (78x), Ace (68x), King (68x), Queen (58x), Jack (58x), Ten (58x) and 9 (48x). 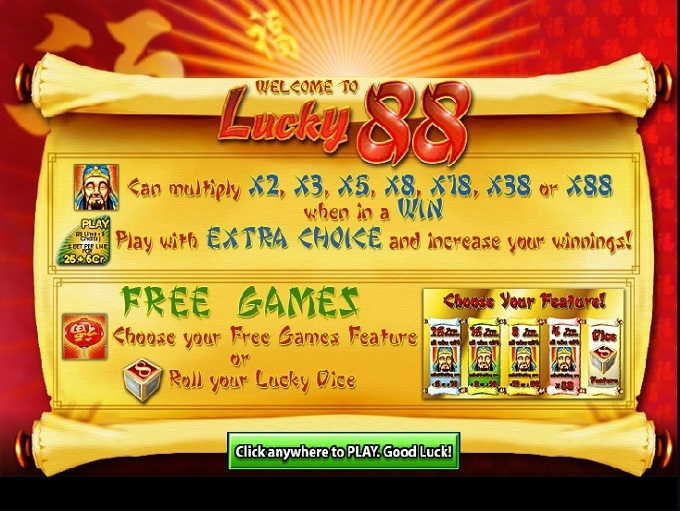 If you’d like all the luck you can get on your side, Lucky 88 is the kind of slot machine which tries to take advantage of the powers of number 8. Whether you believe in that or not, it’s still a slot which seems like a good choice. 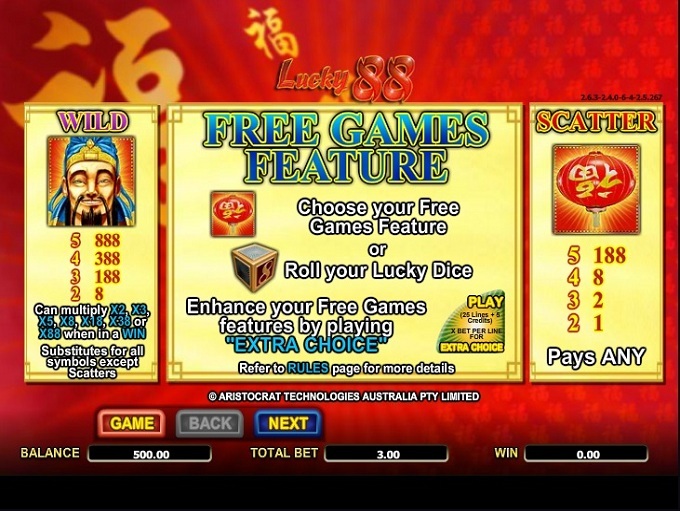 You will find Lucky 88 at any online casino which chooses to use software from Aristocrat, playable either for free or for real money.